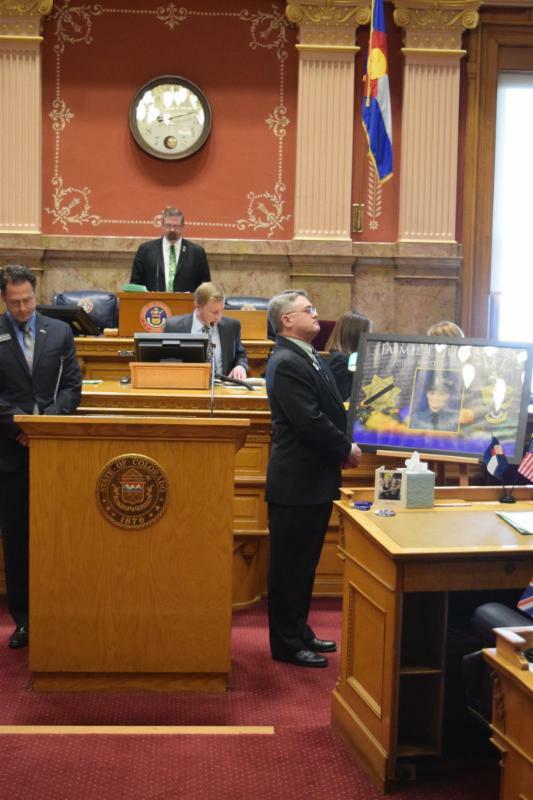 DENVER—Today, a bill sponsored by Senator Chris Holbert (R- Douglas County) in regards to penalties for drivers who do not exhibit care when passing stationary vehicles on the road passed in the Senate Judiciary Committee. Senate Bill 17-229 adds to current law concerning drivers who fail to exhibit necessary care and caution when passing stationary emergency vehicles or towing carrier vehicles. Current law makes this a class A traffic offense. SB-229 adds stationary public utility service vehicles to current current statute, as well as increases the penalty to a class 1 misdemeanor if the driver causes bodily harm to another person, and a class 6 felony if the driver causes the death of another person. The bill is named in honor of fallen Trooper Cody Donahue whose life was taken last year when a tractor-trailer failed to yield for the stopped emergency vehicle. With the law in place as it is, there have been hundreds of convictions for careless driving in the past year. The penalty for this conviction can be between $150 to $1000, and 10 days to 12 months in jail, depending on whether anyone was hurt or killed by proximate cause of the driver’s actions. SB-229 increases the penalty for such careless driving, as well as expands the language of the statute to include another type of stationary vehicle. By including more vehicles and increasing the punishment that those who violate the law will receive, the bill promotes safer roads and fewer accidents that lead to injury and even death caused by drivers’ inattention to or disregard for traffic laws. “The loss of Troopers Donahue, Jursevics and every other first responder or civilian who lost their life in a routine roadside stop is tragic, and should not have happened," said Holbert. "We can save lives with this bill. We can stop this senseless loss of life, and we can tell the families who have suffered with this incredible burden that their loved ones' passing was not in vain." The Move Over for Cody Act now moves to the House for consideration.